The social movements that Professor Toch examines in this book, originally published in 1966, range from the Black Muslims to food faddists, and the founders of these movements range from Hitler to Joan of Arc. Why do people join social movements? How do such movements serve the needs of their members, and what unique social problems do they cause? What are the typical consequences of membership? What gives rise to social movements, and how can we evaluate them? 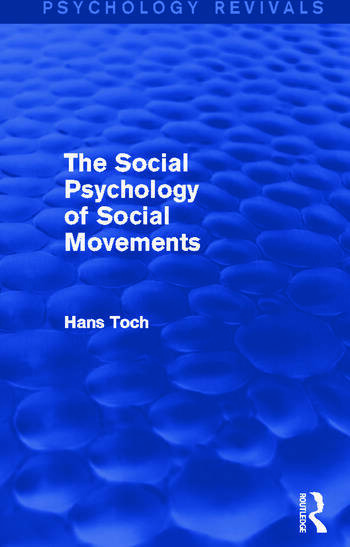 In The Social Psychology of Social Movements Hans Toch provides answers to these questions. It is impossible to avoid in a study of this sort the universal human implications of social movements, the latent tragedy and despair which involvement in such collective action implies. The humour, adversity and pathos is equally evident in many of the examples which Professor Toch describes. But he provides a sympathetic objectivity, and is at pains to provide a systematic psychological survey of large, ideologically orientated groups and their members in general. Part 1: The Nature of Social Movements 1 The Solution of Collective Problems 2 Illusions as Solutions 3 The Benefit of Perceiving Conspiracies 4 Gain Through Community 5 The Exploitation of Predispositions Part 2: The Career of Members 6 The Psychology of ‘Seeing the Light’ 7 The Consequences of Being a Member 8 The Dynamics of Disaffection Part 3: Determinants and Motives 9 The Motivation to Join 10 Social Movements and Conventional Society 11 The Psychological Evaluation of Social Movements. Index.